Shrimp is easily one of the ‘ easiest’ types of seafood to cook. 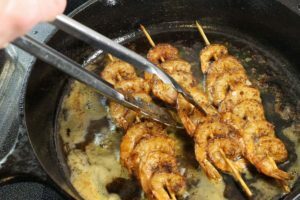 Relatively light in flavor, shrimp are often labeled plain, flavorless, and I often have people ask me what the best way to season or flavor shrimp is. While I do love a good garlic lemon shrimp, sometimes a stronger punch of flavor is what I’m craving. These blackened shrimp skewers provide just that, using a traditional Cajun spice mix and paired with a refreshing cucumber and lime dip. Perfect as a light meal on their own, or served alongside a simple rice pilaf and salad for a more filling meal. They make a great addition to party platters, and are always a hit at family gatherings and BBQ’s! The blackening spice used to flavor the shrimp is a natural fit to the quick cooking nature of shrimp. By searing the blackened shrimp in a hot (preferably cast iron) pan, the shrimp are just finished as the spice starts to toast and lightly char. Blackening spice, also called blackened spice, is a traditional Cajun spice mixture used to to ‘blacken’ meats. Cajun cooking has it’s roots in French cuisine being developed by Acadians after settling in Louisianna. While very similar to Creole, there are some major differences in the two styles of cooking. Cajun is often more rustic, with classical French Influences, while Creole has some Spanish, Italian, and even African roots. 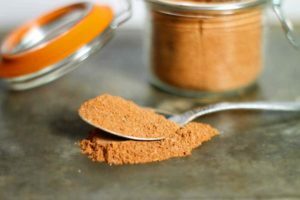 Blackening spice is easy to make at home and is made by mixing, paprika, cayenne, garlic powder, onion powder, thyme, oregano, black pepper, salt, and basil. All spices you should have in a well stocked pantry already! The great thing about making your own blackening spice at home, is that you can easily make small adjustments to suit your personal tastes. Like it Hot & Spicy? add some cayenne and even some chili powder to the mix. If heat isn’t your thing, simply reduce or even leave out the cayenne to create a sweeter blackening blend. Click the Picture above to save the Blackening Spice Recipe for later! Fish and Shellfish are a popular protein to blacken as the spice mix adds a lot of flavor to otherwise subtle flavors. Ideal for the rich and flavorful Cajun style of cooking this technique originated in. Chicken and steak can also be blackened and follow the same procedure outlined below. Heat a thick bottomed pan or cast iron skillet over medium high heat. Mix your favorite/ homemade blackening spice with melted butter. Make sure to have enough melted butter/spice mix to liberally coat your meat/fish. Remove your protein from the fridge and pat dry with paper towel or a clean cloth. Making sure the meat is cold and dry will help the butter mixture stick better. Cook the meat for 2 to 3 minutes on one side and then flip using a pair of tongs. Cook for another 2 minutes. Keeping the meat you’re cooking thin (about 1/2 inch or 1.5 centimeters thick) will help it cook faster, which is why shrimp are ideal for blackening! 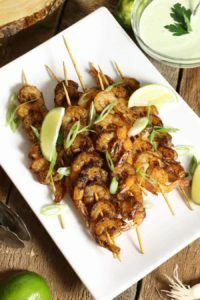 The great thing about these Cajun blackened shrimp skewers is that since the shrimp are all skewered together, they are easy to cook and flip all at once!. This makes them ideal for cooking batches of skewers. 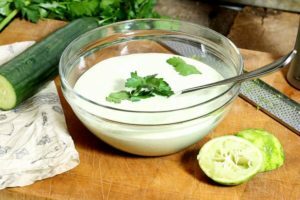 The light and refreshing cucumber lime dip is a great match to the strong flavors of the blackening spice. In this recipe I’m using 61-70 shrimp. This means that there are about 61-70 shrimp per pound. The shrimp are fairly small and I find it makes it easier to get multiple shrimp on the skewer. 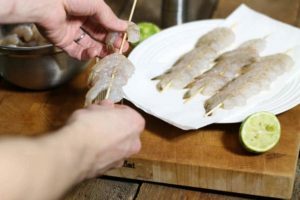 You could use larger shrimp such as 21-25 (also known as Jumbo Shrimp) but you may only get three or four on a skewer and they will take longer to cook. I suggest making the dip first, as you can easily keep it in the fridge, and use it later as needed. This way you aren’t scrambling to make it once the blackened shrimp are cooked. Juice and zest the lime with a micro-plane. Take the cucumber and cut it in half, and then in quarters. remove the seeds by running a sharp knife along the flesh. Discard the seeds as this part is mostly just water and will thin out the dip unnecessarily. Keep the firm cucumber flesh and skin. Roughly chop the cucumber and then combine all the dip ingredients in a food processor. Blitz until smooth, and season with salt and pepper. You can mix some parsley right in or simply use it to garnish the dip. Now for the fun part! Note that the blackened shrimp should be served right after cooking if possible. you may keep them warm in a pre-heated oven if necessary. If you’re making your own blackening spice blend, awesome!! Mix it up and then melt, 1 cup or half a pound of butter. Mix the homemade blackened spice and melted butter together in a shallow dish or pan. I found a rectangular Rubbermaid container works well. This way you can easily dip the whole shrimp skewer in the spice mix and turn it to coat both sides. Pat dry the shrimp with a clean cloth or paper towel, and then skewer 5 to 6 shrimp on a wooden skewer. Place the skewered shrimp into the blackening spice/butter mix making sure to coat all the shrimp really well. If you need to do this in batches that’s fine! As the shrimp sits in the blackening spice mix, pre-heat a cast iron skillet or thick bottomed pan on your stove with a small splash of oil. In the summer you can also do this on a BBQ. Once the pan is smoking hot, take one or two shrimp skewers from the spice/butter mix and immediately place them in the hot pan. They will sizzle right away, and if you’re doing this on a BBQ may flare up so watch out! Cook the skewers on each side for about 2 minutes or until the blackening spice starts to just barely char around the edges. Again, you do not want to BURN the shrimp! 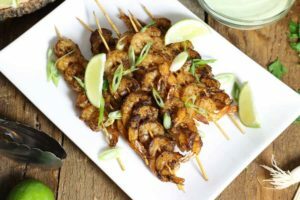 Once the blackened shrimp skewers are cooked on both sides, take the skewer out of the pan with tongs and serve right away with the cucumber lime dip! 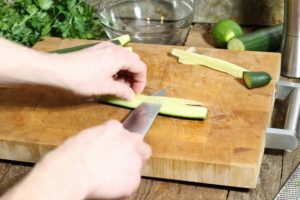 You can finely chop some green onion and use it as a garnish if you like. 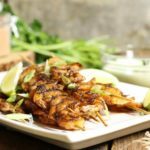 These Cajun blackened shrimp skewers are easy to make, and the ideal appetizer or party food item. A great light meal when served with rice or salad full of Cajun flavors. Juice and zest the lime with a microplane. Take the cucumber and cut it in half, and then in quarters. remove the seeds by running a sharp knife along the flesh. Discard the seeds as this part is mostly just water and will thin out the dip unnecessarily. Keep the firm cucumber flesh and skin. Roughly chop the cucumber and then combine all the dip ingredients in a food processor. Blitz until smooth, and season with salt and pepper. If you're making your own blackening spice blend, awesome!! Mix it up and then melt, 1 cup or half a pound of butter. Pat dry the shrimp with a clean cloth or paper towel, and then skewer 5 to 6 shrimp on a wooden skewer. Place the skewered shrimp into the blackening spice/butter mix making sure to coat all the shrimp really well. As the shrimp sits in the blackening spice mix, pre-heat a cast iron skillet or thick bottomed pan on your stove with a small splash of oil. Once the pan is smoking hot, take one or two shrimp skewers from the spice/butter mix and immediately place them in the hot pan. They will sizzle right away. Cook the skewers on each side for about 2 minutes or until the blackening spice starts to just barely char around the edges. 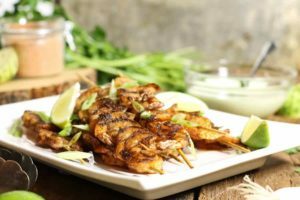 Once the blackened shrimp skewers are cooked on both sides, take the skewer out of the pan with tongs and serve right away with the cucumber lime dip! Finely chop some green onion and use it as a garnish if you like. Nice recipe. My experience with blackening is that it can produce an unholy amount of smoke so be ready to open windows and shut off the fire alarm! The suggestion of doing on the BBQ certainly makes sense. My mouth is watering as I read through your recipe for Blackened Shrimp Skewers, Markus! It looks delicious! I love different ideas for appetizers and this one is very appealing to me. 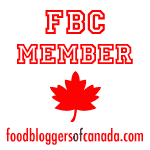 Thanks also for sharing your recipe for blackening spices – it is awesome! You’re welcome Denise! Glad you liked the recipe, I’ll be using the spice mix myself soon on chicken!! Love this idea! An easy appetizer that looks impressive. I will definitely make these for my next gathering! Great! Let me know how they turn out. Tag me on social media with a pic! This is MY kind of meal! I love blackened anything, and shrimp are a favourite choice in our house. Great recipe! Markus! This is one of those combinations that I don’t think I ever would’ve thought of if I didn’t read it here. It sounds fantastic, and I’ll definitely be giving it a try soon! Take a picture and tag me on social media when you do! I’d love to see how it turns out!